Historic row house in the heart of Old Town. The original heart pine floors, fireplace, and exposed brick reflect the character of the home. A beautifully renovated kitchen with farm sink and tile backsplash as well as a gorgeous spa-like master bath bring it into the 21st century. Enjoy some warm cider around a fire-pit in the large, bricked courtyard urrounded by mature trees and access to street. The custom whiskey bar on the lower level is also a wonderful gathering place. Just a short walk to all the shops and restaurants, waterfront, metro, and all that Old Town has to offer. ***Check out the 3D tour of this home! Directions:From I-495 take exit for US-1 N/S (Patrick Street). Turn right onto Queen Street, home on left. SchoolsClick map icons below to view information for schools near 425 Queen St Alexandria, VA 22314. Home for sale at 425 Queen St Alexandria, VA 22314. Description: The home at 425 Queen St Alexandria, VA 22314 with the MLS Number VAAX192982 is currently listed at $835,000 and has been on the Alexandria market for 98 days. 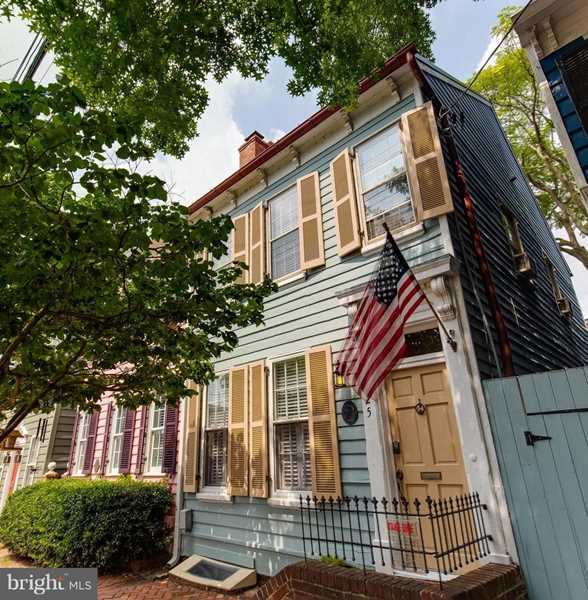 You are viewing the MLS property details of the home for sale at 425 Queen St Alexandria, VA 22314, which is located in the Old Town subdivision, includes 3 bedrooms and 3 bathrooms, and has approximately 1472 sq.ft. of living area.